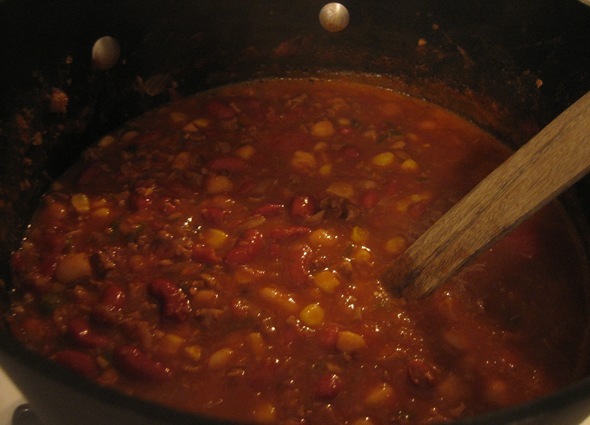 When winter hits, thoughts of a steaming bowl of hearty, vegetarian chili makes the wind slapping my face, the ringing chill in my ears and frostbite in my fingers seem a little less awful. A stockpot of it warms up our house and our bellies for a few days. I like to top mine with shredded, cheddar cheese and fritos (yes, as in Frito O’Lays – great for scooping up the chili) but it’s also just as good plain, topped with diced, raw onions or with a dab of sour cream. 1. Heat about a tablespoon of oil (I use olive oil) in a stockpot. Add onions, garlic and peppers and cook until the onions are translucent. 3. Add the diced tomatoes. Gently run a kitchen knife or kitchen shears through the can of whole tomatoes so the pieces get cut up. Add the entire can (with juice) to the stockpot along with the carton of vegetable broth. 5. Open all of the canned beans, pour them into a strainer and rinse under the faucet in cold water. This reduces the amount of sodium and apparently gets rid of some of the gas-producing sugars (okay, not appetizing but important right?!). Add to the stockpot. 6. Cook on medium heat, uncovered for about 30 – 40 minutes until it reaches desired consistency. Taste to see if you need more salt. Not only is a bowl of chili warming but it’s main ingredients store well. In our house, a few extra cans of beans, stewed tomatoes, vegetable broth, soy crumbles, frozen corn and chili seasoning are staples so I keep them on stock. One of the biggest reasons people don’t cook is because they don’t have time to first go grocery shopping. So, the next time you go to the grocery store, stock your kitchen with these…that way, you can make chili on a whim without a lot of prepping and pre-planning – all you’ll have to do is pick up the fresh produce. **Tofu is a good, though less chewy substitute for crumbles. Take a block of tofu and crumble it with your hands. Pan fry with a little oil until golden. You inspired us to make chili last night too. It was cold down here, and we lit a fire, and had some chili and wine to stay warm. Thanks for the great idea! thanks for posting this! i made it over the long weekend along with some cornbread, and we both really enjoyed it :). made us miss you guys! Whts ur real name , if I may ask. I like ur blog…found u thru foodie blog roll…m new there too…(5 most recent blogs). Hi Navita, I guess you bring to light a good point that it’s time to get over my fear of the web and put my name out there. It’s great to meet you and your blog looks fantastic – congrats. Btw the link from my FBR widget to your blog is incorrect! It links as http://cooking-up-a-storm-zaayeka.blogPOST.com/ not SPOT. Hey Nithya, thanks for pointing that out. I have emailed FBR about the same. However, could u advice as to what I can do at my end to rectify the same! lalitha, glad that you made the chili…come visit us…I promise to feed you and Anil! A Side of Roasted Cauliflower - Dinner Party Worthy?